Given a choice between a regular cake with lots of frosting or a good old fashioned coffee cake, I will almost always choose the latter. And a coffee cake with a thick crumb topping? That I'll choose every time. Now that fall is here, and so many glorious apples are available, I couldn't resist making an apple cake...an over the top good apple cake. Tall and moist, with sour cream and lots of fragrant cinnamon.. It was a seasonal beauty and definitely going on the make again soon list. Enjoy! To make the crumb topping, combine the sugar, salt, flour and cinnamon in a bowl. Stir in the melted butter and let sit while you assemble the rest of the cake. To make the cake, cream the eggs and sugar together using either a stand mixer or a hand mixer. Beat in the butter. Add the vanilla and sour cream and continue mixing until combined. In a separate bowl, combine the flour, baking soda, cinnamon and salt. Stir into the batter and mix. Add the diced apples and stir just until combined. To assemble the cake, pour the cake layer batter into a buttered and floured tube pan. Crumble the crumb topping evenly over the batter and bake in a pre-heated 350 degree oven for approximately 40 - 50 minutes or until a cake tester comes out clean. Allow to cool completely before removing from the pan. Drizzle the top with caramel sauce. Makes approximately 10 servings. I could just peel off that whole layer of crumb and die happy. 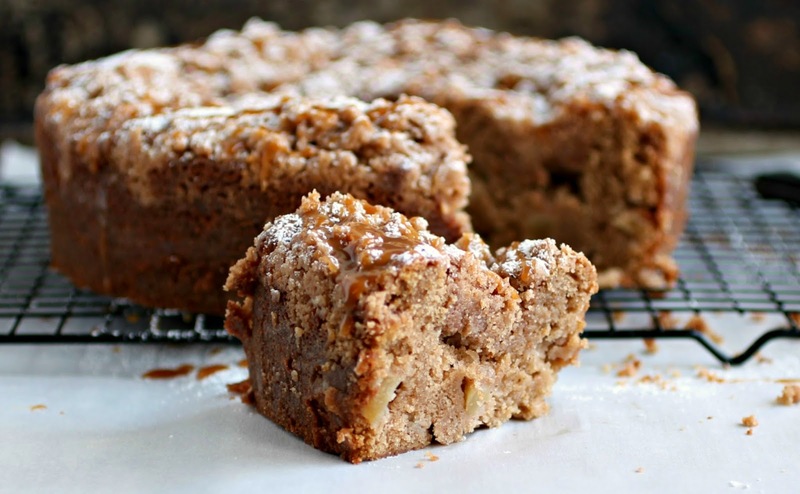 Moist, apple-y and crumb topped. yes please! 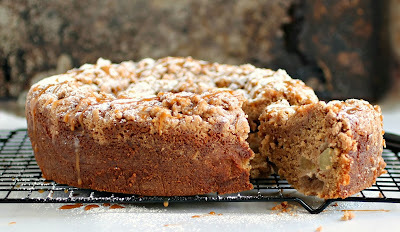 Yum.. that coffee cake is so moist. Love the caramel and apple combination. Anita, as much as I like frosting I'm in accordance with you on this beauty. Wow! look at the crumb topping and chunks of apple. Glorious work. Your crumb topping sent me into fits jealousy. OH, how I need a slice (or 12) of this cake! 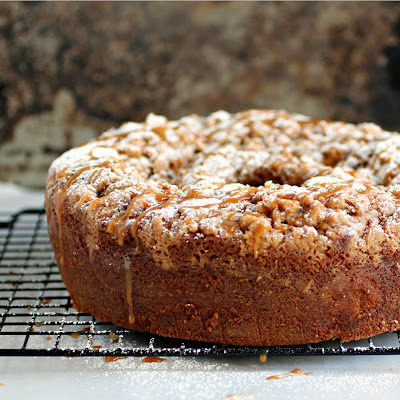 I'm with you - I'm not a huge cake person but put a coffee cake in front me? It's my kryptonite. I love cake stuffed apple and cinnamon! I am hoping someone invites me over for coffee...'cause I need an excuse to make this, but not have it in my house where I'd devour it all!!! Fabulous, Anita!! Seriously wishing I had a great big slice of this right now. Oh yummy!! This recipe looks great! I have to try it! Dang, Anita, this is like autumn in cake form. I need to bake this asap! 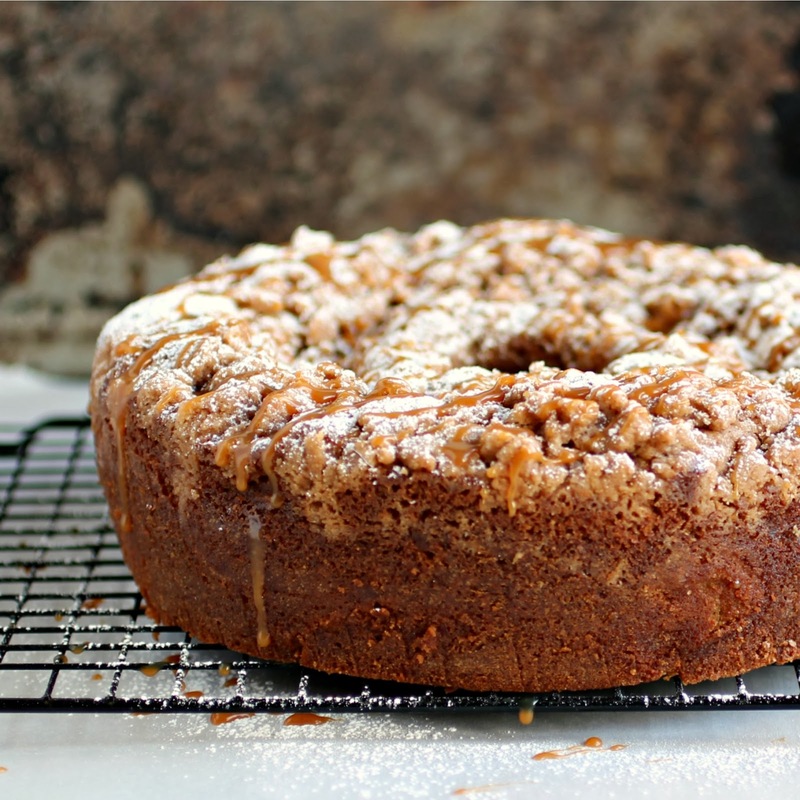 Your bundt cakes just keep getting better and better. This one looks very yummy. The moistness and big apple chunks are always a hit. Fantastic, tried this today. Unbelievable.